Motorola has unleashed its new range of smartphones, the Moto G7. 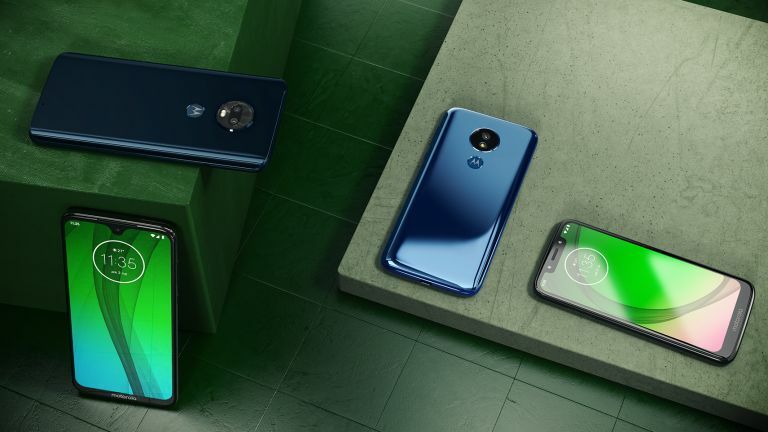 The new line-up follows the hugely successful Moto G6 range, which included three models (G6, G6 Plus, and G6 Play) launched in April 2018. This time around, Motorola will launch four – count them, four! – new smartphones in its Moto G7 range, starting from £149 and topping-out at £269 for the flagship. The complete range consists of Moto G7 Play, G7 Power, G7 and G7 Plus. Motorola has relocated the circular fingerprint scanner onto the back of the handset across the entire Moto G7 range. According to research conducted by the firm, there is no clear preference amongst consumers when it comes to scanner placement. Since placing the sensor on the back allows the company to squeeze a larger display into the device without dramatically increasing the physical footprint of the handset, that's what it has decided to do. Moto G7 Play is 60% faster than its predecessor, thanks to the new Qualcomm Snapdragon 632 chipset tucked inside the handset. That's the primary selling point compared to the G6 Play. Elsewhere, there is an ultra-wide 5.7-inch HD+ screen with a 19:9 aspect ratio, and a 13-megapixel rear-mounted camera. Moto G7 Power is an entirely new addition to the Moto G range, while everything else is a follow-up to the equivalent Moto G6 handset launched last year. Motorola says it added the new model to the line-up because it saw that battery power was a pain-point with consumers, and it thought it could solve the issue. To solve any battery life qualms, Motorola has crammed a mammoth 5,000mAh battery cell inside the handset. According to the company, that should result in 60 hours of mixed-use battery life, or around two and a half days. Obviously, we'll need to get our hands on the smartphone to thoroughly test those claims to see if they hold-up outside of the Motorola R&D department, but it certainly sounds very promising. The Moto G7 and G7 Plus are the all-singing, all-dancing handsets. Both boast TurboPower fast-charging technology. In the box, you'll find a USB-C to USB-C cable to enable the speedier recharges. According to Motorola, you can use the same cable to share power with a friend who is running low on juice. Motorola is also using Gorilla Glass on the front and back of the G7 and G7 Plus, which should improve durability. Although, these upgrades have resulted in a slight price bump of some £20 ($50) for the Moto G7. With increase competition from the likes of Xiaomi and Honor, it will be interesting to see just how brand-loyal Motorola's customers remain in the face of the price increase. There are a truckload of AI features packed into the smartphone. The company is using "Smile Detection" to automatically hit the shutter button whenever the smartphone detects that everyone in frame is grinning appropriately wide. Motorola has also added a new feature known as "Smart Composition" that will automatically align any wonky snaps and crop them using the rule of thirds. The resulting photo is saved completely separate from your original shot, so you don't have to worry about the original shot being scrapped by an overconfident AI with a passing interest in photography. All four handsets are running Android 9.0 Pie, as you'd expect from a flagship smartphone range launched in 2019. There is a protective case bundled in the box with each of these smartphones, so there's no need to buy one separately. Moto G7 Play, G7 Power, G7 and G7 Plus will launch March 1, 2019 in the UK.